This section is still being developed. 224 - Ross Road, named for Sir James Clark Ross, Aston Abbots, Aylesbury, Bucks, UK. 227 - Ross Road, named for Sir James Clark Ross, Stanley, Falkland Islands. 295 - Scott Road, named for Robert Falcon Scott, Central Cardiff, Wales, UK. 351 - James Street, named for Sir James Clark Ross, Stanley, Falkland Islands. 352 - Scoresby Close, named for William Scoresby, Stanley, Falkland Islands. 353 - Discovery Close, named for Robert Scott's ship, Stanley, Falkland Islands. 354 - Shackleton Drive, named for Sir Ernest Shackleton, Stanley, Falkland Islands. 355 - John Biscoe Road, named for John Biscoe, Stanley, Falkland Islands. 356 - Endurance Avenue, named for Shackleton's ship, Stanley, Falkland Islands. 357 - Crozier Place, named for Francis Crozier, Stanley, Falkland Islands. 377 - Falcon Street, named for Robert Falcon Scott, Dunedin, New Zealand. 378 - Oates Street, named for L.E.G. Oates, Dunedin, New Zealand. 437 - Davis Street, named for John Davis, Stanley, Falkland Islands. 445 - Brisbane Road, named for Matthew Brisbane, Stanley, Falkland Islands. 466 - Scott Road, named for Robert Falcon Scott, Milehouse, Plymouth, UK. 467 - Oates Road, named for L.E.G. Oates, Milehouse, Plymouth, UK. 468 - Wilson Crescent, named for Edward A. Wilson, Milehouse, Plymouth, UK. 469 - Bowers Road, named for Henry 'Birdie' Bowers, Milehouse, Plymouth, UK. 470 - Evans Place, named for Edgar Evans, Milehouse, Plymouth, UK. 471 - Terra Nova Green, named for Scott's ship, Milehouse, Plymouth, UK. 472 - Scott Road, named for Robert Falcon Scott, Portsmouth, Hampshire, UK. 493 - Numerous roads named for Antarcticans in Mawson, Australia. 550 - Shackleton Road, named for Sir Ernest Shackleton, Mt. Eden, Auckland, NZ. 649 - Scott Road, named for Robert Falcon Scott, Dundee, Scotland, UK. 654 - Roald Amundsen gate [Roald Amundsen Street], named for Roald Amundsen, Oslo, Norway. 671 - Scott Street, named for Robert Falcon Scott, Orbost, Victoria, Australia. 672 - Wilson Street, named for Edward A. Wilson, Orbost, Victoria, Australia . 673 - Oates Street, named for L.E.G. Oates, Orbost, Victoria, Australia. 674 - Bowers Street, named for Henry 'Birdie' Bowers, Orbost, Victoria, Australia . 675 - Evans Street, named for Edgar Evans, Orbost, Victoria, Australia. 676 - Shackleton Street, named for Sir Ernest Shackleton, Orbost, Victoria, Australia. 677 - Mawson Street, named for Sir Douglas Mawson, Orbost, Victoria, Australia. 678 - David Street, named for Edgeworth David, Orbost, Victoria, Australia. 688 - Martin Rønne's Veien/Gate, named for Martin Rønne, Horten, Norway. 709 - Mawson Road, not named for Sir Douglas Mawson, Cambridge, UK. 766 - C.A. 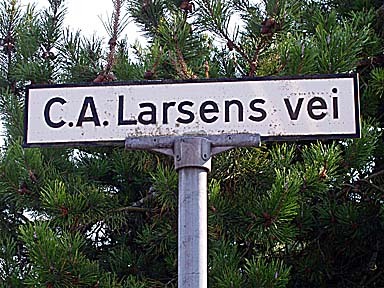 Larsens vei/way, named for C.A. Larsen, Larvik, Norway. 768 - Enderby Street, named for the Enderby brothers, Greenwich, London SE10, UK. 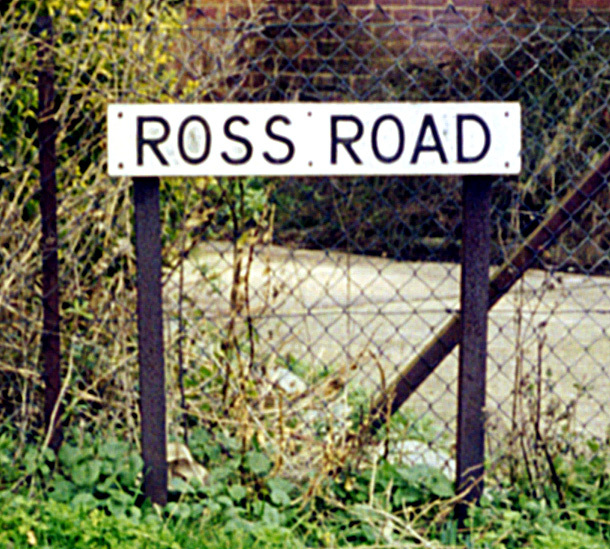 Ross Road, named for Sir James Clark Ross, Aston Abbots, Aylesbury, Bucks, UK. Ross Road, named for Sir James Clark Ross, Stanley, Falkland Islands. Scott Road, named for Robert Falcon Scott, Central Cardiff, Wales, UK. James Street, named for Sir James Clark Ross, Stanley, Falkland Islands. Scoresby Close, named for William Scoresby, Stanley, Falkland Islands. Discovery Close, named for Robert Scott's ship, Stanley, Falkland Islands. Shackleton Drive, named for Sir Ernest Shackleton, Stanley, Falkland Islands. John Biscoe Road, named for John Biscoe, Stanley, Falkland Islands. Endurance Avenue, named for Shackleton's ship, Stanley, Falkland Islands. Crozier Place, named for Francis Crozier, Stanley, Falkland Islands. Falcon Street, named for Robert Falcon Scott, Dunedin, New Zealand. 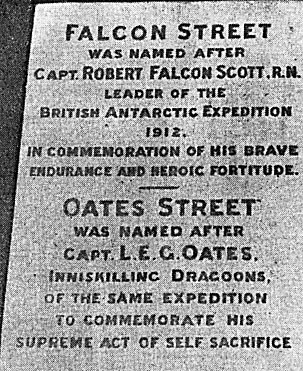 In Dunedin, John and James Streets in Kaikorai Valley were renamed Falcon and Oates Streets in 1913, though it was not until 21 June 1939 that the memorial plaque was unveiled. It reads: 'Falcon Street was named after Capt. Robert Falcon Scott R.N. Leader of the British Antarctic Expedition 1912 in commemoration of his brave endurance and heroic fortitude. Oates Street was named after Capt. L.E.G. Oates, Inniskilling Dragoons, of the same expedition, to commemorate his supreme act of self-sacrifice.' Mayor A.H. Allen, Bishop Fitchett and Howard Ninnis, who had served in Shackleton's 1914-16 expedition, spoke at the ceremony. The original plaque--shown below--appears to have been replaced by one of a slightly different design. Source: Ian Church, Last Port to Antarctica, p.32. Original appeared in the Evening Star. Oates Street, named for L.E.G. Oates, Dunedin, New Zealand. Davis Street, named for John Davis, Stanley, Falkland Islands. Brisbane Road, named for Matthew Brisbane, Stanley, Falkland Islands. 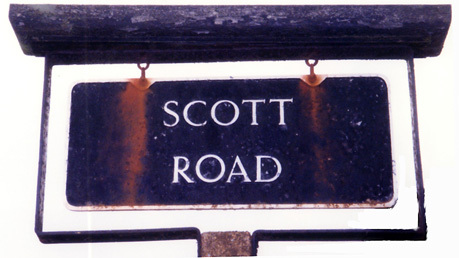 Scott Road, named for Robert Falcon Scott, Milehouse, Plymouth, UK. 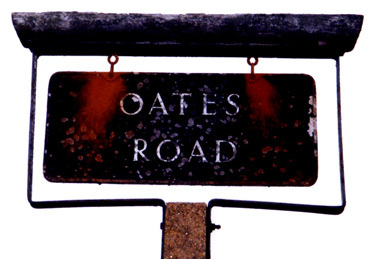 Oates Road, named for L.E.G. Oates, Milehouse, Plymouth, UK. 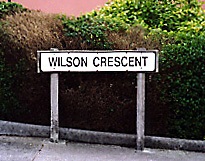 Wilson Crescent, named for Edward A. Wilson, Milehouse, Plymouth, UK. 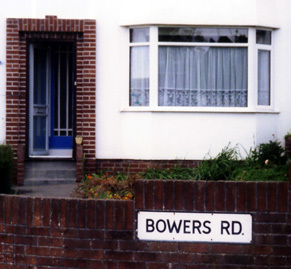 Bowers Road, named for Henry 'Birdie' Bowers, Milehouse, Plymouth, UK. Evans Place, named for Edgar Evans, Milehouse, Plymouth, UK. Terra Nova Green, named for Scott's ship, Milehouse, Plymouth, UK. 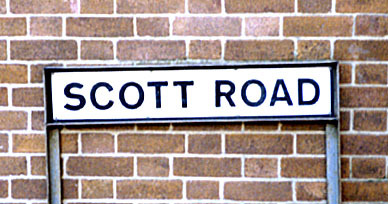 Scott Road, named for Robert Falcon Scott, Portsmouth, Hampshire, UK. Numerous roads named for Antarcticans in Mawson, Australia. The suburb of Mawson was formally established on 12 May 1966. It was named after Sir Douglas Mawson (1882-1958), Antarctic explorer; lecturer 1905-1920, Professor of Geology and Mineralogy University of Adelaide 1921 to 1952, Emeritus Professor 1953-1958; member of Shackleton Expedition 1907-1909; leader of Australasian Antarctic Expedition (AAE) 1911-1914; leader of British Australian and New Zealand Antarctic Research Expedition (BANZARE) 1929-1931. After the second World War, Mawson was a major driving force in convincing the Australian Government to establish the Australian National Antarctic Research Expeditions (ANARE) in 1947 and which continue to this day. The roads within the suburb follow the Antarctic exploration theme. AINSWORTH STREET: George Frederick Ainsworth (1878-1949), Meteorologist and Leader of Macquarie Island Party, Australasian Antarctic Expedition 1911-1914; established a radio station to pick up and relay signals from the continental party led by Mawson; carried out the first detailed scientific investigation of the island. AURORA CLOSE: Ship Aurora used in the Australasian Antarctic Expedition 1911-1914. BAGE PLACE: Captain Edward Frederick Robert Bage (1888-1915), Leader of Southern Party Australasian Antarctic Expedition 1911-1914; with E N Webb and J F Hurley from November 1912 to January 1913 made major magnetic survey in the vicinity of the South Magnetic Pole; killed in action at Gallipoli, Turkey 1915. BERNACCHI STREET: Louis Charles Bernacchi (1874-1942), Tasmanian physicist; member British Antarctic Expedition under Carsten Borchgrevink 1898-1900; first use of dogs in the Antarctic and first expedition to winter on the Antarctic mainland (1899); with Scott on the Discovery National Antarctic Expedition 1901-1904. 1918. BRIDE PLACE: Dr Thomas Francis Bride (1851-1927), librarian, Member of first Australian Antarctic Exploration Committee 1886; Member of the Royal Geographical Society of Australasia; Librarian Melbourne Public Library 1881-1895. COLBECK STREET: Captain William R Colbeck (1871-1930), magnetician, member of British Antarctic Expedition 1898-1900 under Carsten Borchgrevink Captain of the Morning Star on two expeditions to relieve Scott's Discovery expedition 1902-1904. DEBENHAM STREET: Professor Frank Debenham, (1883-1965), Australian geographer and geologist; member Scott's second expedition British National Antarctic Expedition 1910-1913, explored the dry valleys and parts of Victoria Land; professor of geography Cambridge University 1931-1946; instrumental in setting up the Scott Polar Research Institute, Cambridge 1926; Editor of the Institute's Polar Record. DU FAUR PLACE: DU FAUR STREET: Eccleston Frederic Du Faur (1832-1915), cartographer, closely associated with Australian and New Guinea exploration; prominent advocate of Antarctic exploration and research particularly in meteorology and sea ice; advocated a tourist trip to Antarctic waters in 1892 as a means of stirring interest; foundation Member New South Wales Geographical Society; Foundation Secretary and Treasurer National Art Gallery. ENDERBY PLACE: ENDERBY STREET: Enderby family of London, merchants and shipowners, whose captains carried out notable exploration work within the Antarctic Circle. Samuel Enderby was a promoter of voyages of discovery and the father of British whaling, his son Charles was one of the early patrons of British Antarctic exploration and succeeded to the family business on the death of his father. In 1830 he helped to found the Royal Geographical Society. Sponsored the sealing voyages of Biscoe, Rea and Balleny and in 1839 established a whaling station on the Auckland Islands. HANNAM PLACE: Walter H Hannam (1885-1965), mechanic and wireless operator, member Australasian Antarctic Expedition 1911-1914; associated with transmission of the first wireless message from Antarctica in February 1913 when two way communication between Adelie Land and Macquarie Island was achieved for the first time. HEARD STREET: Heard Island, a staging point for Australian Antarctic exploration in the initial years after the setting up the Australian National Antarctic Research Expeditions in 1947; site of a research station 1948-55. Heard Island derived its name from an American, Captain John Heard of the Oriental who rediscovered the island on 25 November 1853. HOADLEY STREET: Charles Archibald Hoadley (1887-1948), geologist, member Australian Antarctic Expedition 1911-1914; Principal, Footscray Technical College 1916-1920 and 1923-1948; Chief Commissioner of Scouts, Victoria 1927-1937. HODGEMAN STREET: Alfred J Hodgeman (1886-1964), cartographer, member of Australasian Antarctic Expedition of 1911-1914. HOSEASON STREET: Richard James Hoseason (1924-1952), Radio Operator, member of Heard Island Party, Australian National Antarctic Research Expedition 1952, drowned when swept out to sea. There is a small commemorative plaque to Hoseason set into the ground just off the pavement in Hoseason Street near its junction with Hoadley Street. HURLEY STREET: James Francis Hurley (1890-1962), photographer, author and explorer; in 1911 bribed a train conductor to secure a seat next to Mawson and persuaded Mawson to take him to Antarctica; official photographer Australasian Antarctic Expedition 1911-1914 and was a member of the magnetic pole party establishing a sledging record of 66 kilometers in one day; British Imperial Trans-Antarctic Expedition 1914-1916; when the Endurance was crushed in the pack ice he managed to save 120 of over 500 photographic plates and they have since become Hurley's greatest legacy - stark simple and stirring records of that heroic ordeal; joined Mawson's British Australian and New Zealand Expedition 1929-1931; explored parts of Central Australia and New Guinea; was an official Australian war photographer in both world wars. JELBART STREET: John E Jelbart (1927-1951), physicist with Heard Island Party, Australian National Antarctic Research Expedition 1948; Australian observer Norwegian British Swedish Antarctic Expedition 1949-1951, drowned near Maudheim Base, Dronning Maud Land. JOYCE PLACE: Ernest Edward Mills Joyce (1875-1940), participated in several expeditions to the Antarctic including the Discovery and Nimrod expeditions with Shackleton 1907-1909; in 1911 he selected the dogs for Mawson's AAE and Scott; in 1914-1917 led the Ross Sea Party of Shackleton's unsuccessful trans Antarctic expedition. LASERON PLACE: Charles Francis Laseron (1887-1959), conchologist, author, biologist with Australasian Antarctic Expedition 1911-1914. MARKHAM STREET: Sir Clements Robert Markham (1830-1916), author, President Royal Geographical Society 1893-1905; aroused interest in antarctic exploration and research; President International Geographical Congress 1894-1899; his choice of Scott as leader and his insistence on full naval control, determined the final shape of the 1901-1904 Discovery expedition. MAWSON DRIVE: MAWSON PLACE: Sir Douglas Mawson, (1882-1958), Antarctic explorer; lecturer 1905-1920, Professor of Geology and Mineralogy University of Adelaide 1921 to 1952, Emeritus Professor 1953-1958; member of Shackleton Expedition 1907-1909; leader of Australasian Antarctic Expedition (AAE) 1911-1914; leader of British Australian and New Zealand Antarctic Research Expedition (BANZARE) 1929-1931. After the second World War, Mawson was a major driving force in convincing the Australian Government to establish the Australian National Antarctic Research Expeditions (ANARE) in 1947 and which continue to this day. PASCO STREET: Commander Crawford Aitcheson Denham Pasco (1818-1898), naval officer associated with founding settlement at Port Essington 1838, and with hydrographic surveys of Australian waters 1839-1842; member and first president of the first Australian Antarctic Committee 1886-1892; secretary to the Committee on Antarctic Exploration set up under the Australasian Association for the Advancement of Science 1891. POWER STREET: Harold Power (1893-1914), leader Commonwealth Meteorological Expedition Macquarie Island 1913-1914; lost with the Commonwealth fisheries steamer Endeavour which disappeared without a trace after relieving Macquarie Island in 1914. RYMILL PLACE: John Riddoch Rymill (1905-1968), polar explorer and grazier; participated in expeditions to the Arctic and the Antarctic; member of the British Arctic Air Route expedition 1930-1931; leader of the 1934-1937 British expedition to Graham Land which, through the combined use of his vessel the Penola, aircraft, radio, a motor tractor and sixty-four dogs and sledges, proved that Graham Land was a peninsula and not an archipelago as previously thought; a proponent of the small but well planned, trained, equipped and manned expedition. SCOBLE PLACE: Charles H Scoble (1916-1948), engineer, Macquarie Island Party, Australian National Antarctic Research Expedition 1948, accidentally drowned during the expedition. SHACKLETON CIRCUIT: Sir Ernest Henry Shackleton (1874-1922), member British National Antarctic Expedition 1901-1904 marching with Scott and Wilson on the southern journey in 1902; Leader of British National Antarctic Expedition 1907-1908, during this expedition led a party which almost reached the South Magnetic Pole; Leader British Imperial Trans-Antarctic Expedition 1914-1916; sailed to the Antarctic for the last time in the Quest in 1921. STILLWELL PLACE: Frank Leslie StilIwell (1888-1963), geologist Australasian Antarctic Expedition 1911-1914; prominent member Royal Society of Victoria; Research Officer Commonwealth Scientific and Industrial Research Organisation until 1953. TOUTCHER STREET: Norman Champion Toutcher (1884-1924), Chief Naval Officer of the Aurora, ship of Australasian Antarctic Expedition 1911-1914. WILKINS STREET: Sir George Hubert Wilkins (1888-1958), explorer and author; Australian Flying Corps in the closing stages of the first world war; spent 1913-1917 as photographer with Stefansson's Arctic expedition and spent a further three years in the Arctic making major exploratory flights north from Alaska with Ben Eielson; in 1928-29 led an expedition funded by William Randolph Hearst and made the first Antarctic flight from Deception Island over Graham Land to 71o 20' S; attempted to take a submarine under the Arctic ice to the north pole in 1931; took a series of expeditions to Antarctica with Lincoln Ellsworth acting as leader of the support team during Ellsworth's flights. Supplied by Gordon Bain, Hobart, Tasmania. Shackleton Road, named for Sir Ernest Shackleton, Mt. Eden, Auckland, NZ. Scott Road, named for Robert Falcon Scott, Dundee, Scotland, UK. Roald Amundsen gate [Roald Amundsen Street], named for Roald Amundsen, Oslo, Norway. Scott Street, named for Robert Falcon Scott, Orbost, Victoria, Australia. Wilson Street, named for Edward A. Wilson, Orbost, Victoria, Australia. Oates Street, named for L.E.G. Oates, Orbost, Victoria, Australia. Bowers Street, named for Henry 'Birdie' Bowers, Orbost, Victoria, Australia. Evans Street, named for Edgar Evans, Orbost, Victoria, Australia. Shackleton Street, named for Sir Ernest Shackleton, Orbost, Victoria, Australia. Mawson Street, named for Sir Douglas Mawson, Orbost, Victoria, Australia. David Street, named for Edgeworth David, Orbost, Victoria, Australia. 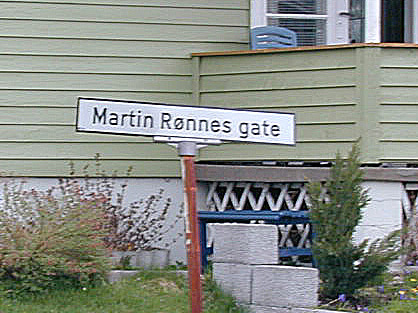 Martin Rønne's Veien/Gate, named for Martin Rønne, Horten, Norway. 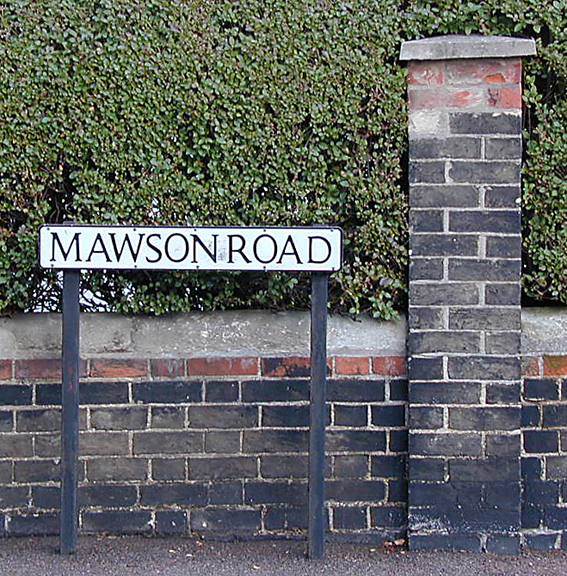 Mawson Road, NOT named for Sir Douglas Mawson, Cambridge, UK. C.A. Larsens vei/way, named for C.A. Larsen, Larvik, Norway. 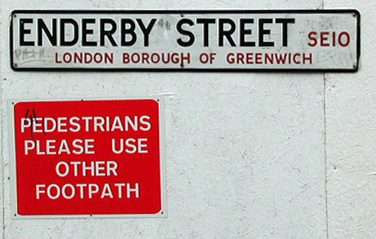 Enderby Street, named for the Enderby brothers, Greenwich, London SE10, UK .